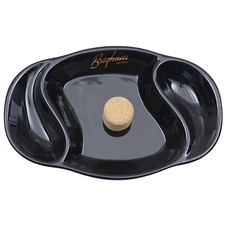 Smooth and dark in style, this Brigham ashtray doesn't look bad at all. More importantly, it is also practical. The arrangement of the pipe rests and the central ashtray is compact, so it doesn't take up any more space than it needs to. The tear-drop shape of those aforementioned rests might look a little odd to the initiated, but you'll find them on a lot of pipe-specific ashtrays for good reason: that shape works well with many different shapes of pipe, bent or straight. Beyond that there's also the obvious, i.e. 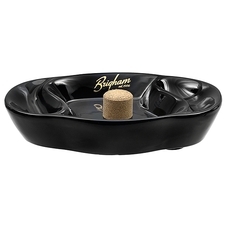 the presence of a convenient cork knocker, and the not-so-obvious, which is four foam rubber feet stuck to the bottom, so you can slide and nudge the ashtray around all you want without worry of scratching the surface of your desk or table.